While I prefer to use a long password to protect my computer, I like the idea of being able to use a physical key to lock it. 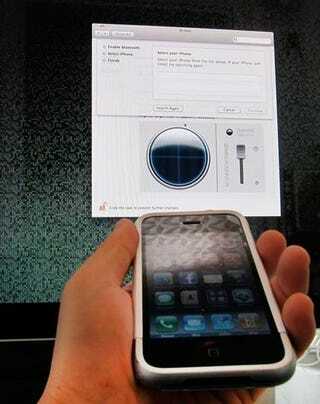 This is precisely what Airlock does, using your iPhone. It works great. Airlock is a system preferences pane. Double-click to install it, associate it with your iPhone or iPod touch, set the security range, and that's it. I tried with my iMac 24 and my iPhone and it worked perfectly. You can even see a radar screen showing the distance between the two devices. The moment I stepped out of the limit, the screen locked. And then, as soon as I came into the perimeter, it unlocked automagically. There is only one problem: If you use a wireless mouse or keyboard, it won't work due to a Bluetooth bug in Mac OS X. Otherwise, this thing will make you feel like James Bond.